Embedding the cropped data of found Instagram photos into woven skeins, the washed, striated surfaces of Margo Wolowiec’s textiles appear as images mid download, registering the staticky visual jitter of perpetual glitch. This temporal disorientation at first masks the weavings’ tactile handling, a medium-blurring sleight of hand at work more broadly in this exhibition, “Catfish.” If the titular term, popularized by reality television, refers to a porous, duplicitous person able to inhabit a fantastical persona, it might also indicate the ease and deferral of perceptual seduction. 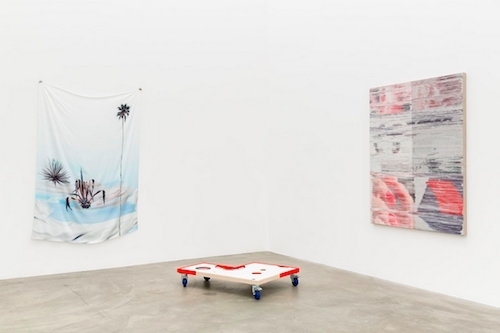 Glimpses of polished red nails in the knit polyester of Wolowiec’s Warning Signs, 2015, allude to the schmaltz of Southern California in the collective imaginary, particularly when paired with Petra Cortright’s Night Heat 13, 2013, a digital print on fluttering silk. The generic, photo-stream kitsch of desktop wallpaper and beach towels inhere in the painting’s spindly palm trees and sea urchins, a figurative legacy that becomes abstracted in fishaquariumfish in australiaaquarium fish, 2014. Constructed from the safe distance of Photoshop, Cortright’s exuberant splotches and candy-colored whorls masquerade as painterly marks, a triumph in further exploiting the Internet’s claim to facilitating personal expression and subjectivity. For Kate Steciw, aggregation becomes a strategy germane to the click-hole sites from which her collaged, fragmented imagery derives: Her glossy architecture-photograph concatenations reveal photography’s mutability, framed by consumerist packaging and lust. The wall at times pokes through Steciw’s shaped frames, as it does in Letha Wilson’s Joshua Tree Concrete Bend, 2015, a photograph of a mountain range in cool purple hues. Containing periodic voids of negative space amid streaks of poured concrete, the work oscillates between two and three dimensions—a state “Catfish” seems to suggest is not only endemic to its makers’ material practices but to our immaterial representations of self.